For years, TV was the most commonly used platform for news among U.S. Hispanics. In recent years, however, the share getting their news from TV has declined, from 92% in 2006 to 79% in 2016. 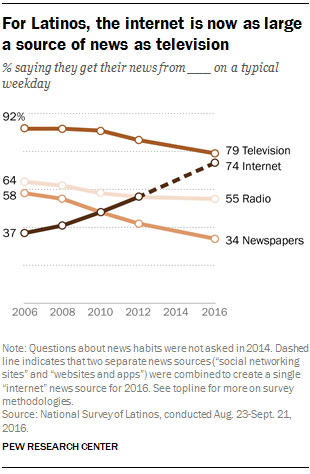 Meanwhile, 74% of Hispanics said in 2016 that they used the internet – including social media or smartphone apps – as a source of news on a typical weekday, up from 37% in 2006. Hispanics also consume news from radio and newspapers, but neither is as widely used as TV or the internet. In 2016, 55% of Hispanics got news from radio on a typical weekday, down from 64% in 2006 (but mostly unchanged from 2012). 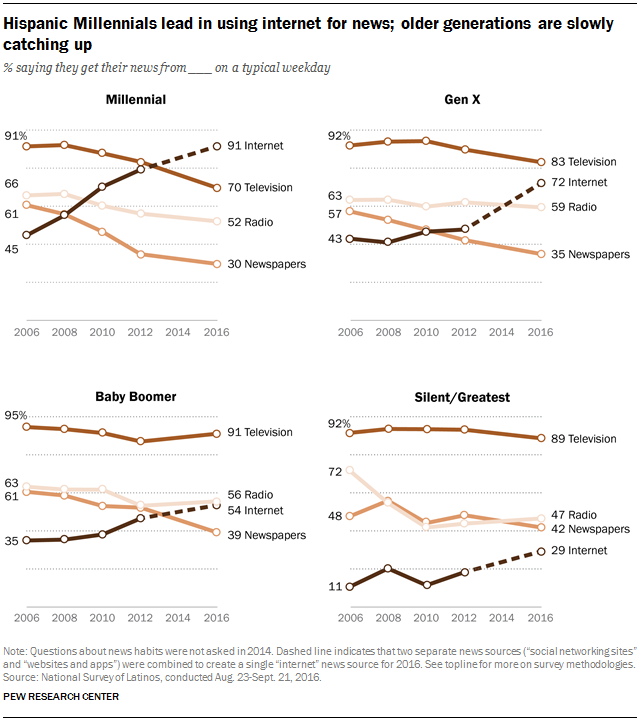 The use of newspapers as a news source continued its decline, falling from 58% in 2006 to 34% a decade later. The growth of the internet as a news source on a typical weekday among Hispanics mirrors the trend in the overall U.S. population. As Pew Research Center previously reported, the internet is closing in on TV as the top source for news among all Americans. Millennials (those ages 18 to 35 in 2016) are driving many of the changes in Hispanic news consumption – in part because this generation makes up more than a quarter of U.S. Hispanic adults, a higher share than among other racial or ethnic groups. In 2016, 91% of Hispanic Millennials got news from the internet on a typical weekday, making them the only generation of Hispanics for which the internet is the most widely used news platform. By contrast, television remains the top source for news among older generations of Hispanics (even as the internet grows as a source of news for all generations). Many Latinos speak English and Spanish, and this bilingualism is reflected in their news habits. In 2016, Latinos primarily consumed news in English, with 83% saying they get at least some of their news in this language on a typical weekday (29% only in English and 54% in both English and Spanish). At the same time, a comparable share (71%) said they get at least some of their news in Spanish (17% only in Spanish and 54% in both English and Spanish). Hispanic Millennials use English-language news sources more than older generations, with 91% in 2016 saying they get at least some of their news in English, compared with 68% who said they consume at least some of their news in Spanish. Foreign-born Latinos, by contrast, prefer Spanish-language news sources: 89% in 2016 said they get at least some of their news in Spanish, and 70% said they get at least some of it in English. The landscape of news outlets has changed over the past decade as the news habits of Hispanics have shifted. Univision and Telemundo, the two largest Spanish-language television networks in the U.S., have had viewership declines in their most popular news programs. In addition, several news outlets that targeted Hispanics as a primary audience, often in English, have either closed or been folded into larger news organizations, including CNN Latino, NBC Latino, Fox News Latino and VOXXI. Note: See here for full topline results and for methodology (PDF).